Dawn Thandeka King (also credited as Dawn Msomi) is a South African actress best known for her starring role as Lindiwe Xulu, the wife of self-made gangster Muzi Xulu, in the SABC1 soapie Uzalo. She also has experience as a radio actress, motivational speaker, MC and an indigenous musician. Dawn's television acting debut was in 2012 in the Mzansi Magic telenovela iNkaba, in which she played the recurring role of flirtatious, gossiping domestic worker Anele. Born and raised in Durban, she studied Drama at Technikon Natal. During her tenure there she starred in many stage plays, including Peace in The Valley, which debuted at the Playhouse Theatre in 2000, directed by Jerry Pooe. She performed her indigenous music at the Land Reform exhibition in NASREC in August 2013, and was invited to perform at The Plat4orm theatre in Bezuidenhoed in Johannesburg, for Woman's month in 2013. She also shot a short film called Black Silence, in November 2013. Dawn was recalled to perform her indigenous music, at The Land Reform Exhibition in February 2014, this time held at the Event's Exhibition Center in Pretoria. She was also involved in two short films called Untitled and Hlezephi, which were directed by Rethabile Mathobi and Tony Miyambo. These short films were part of the Youth Film Project called Mandela's children. In July 2014, Dawn was invited to be part of the cast of Eclipsed, directed by Warona Seane, which had a three-week run at the Soweto Theatre. 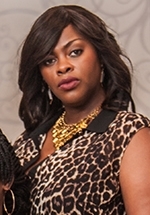 She got her big break in 2015 with a starring role as the matriarch of a gangster family in the SABC1 soapie Uzalo. In 2017 she was cast in the Mzansi Magic prison drama series Lockdown, as tough ringleader Ma Z.